"My Italian husband says this is his absolute favorite dinner. 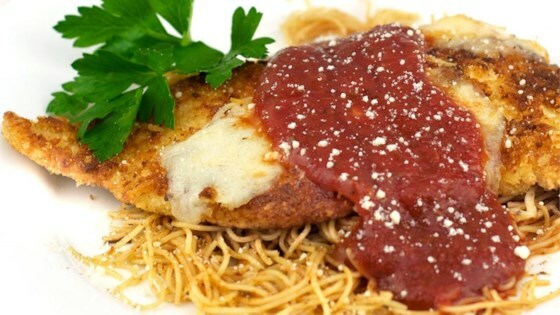 Parmesan-coated chicken swimming in a pool of pasta and sauce with a blanket of melted shredded Italian-blend cheese over all." Serve with a tossed salad and crusty rolls, garlic toast or bread sticks. My preferred storebought sauce is Kroger® brand Napolitana sauce. Made this for Valentine's dinner with my husband--he and I loved it! Will definitely make this again. Very good. I made it as written but topped with an entire shredded block of Mozarella.